This disposable timer is worn by the patient and follows them throughout their care pathway. Time is always available at the patient's side. The band allows for quick time point collection with the press of a button. Your most important metric available instantly. Feedback at a glance. Closing the snap starts the timer. Save time points with the press of a button. Adding the timeband marks your 'time zero' allowing for comparison across cases. Snapping the wristband on a patient automatically activates the timer to start counting up minute-by-minute from 0. Document the time of any patient intervention or step in your process by holding the 'SAVE' button. Review collected timepoints on the timeband by holding the 'CYCLE' button to manually recover data. Record all timepoints wirelessly with any RFID-enabled device over existing hospital WiFi to secure servers. 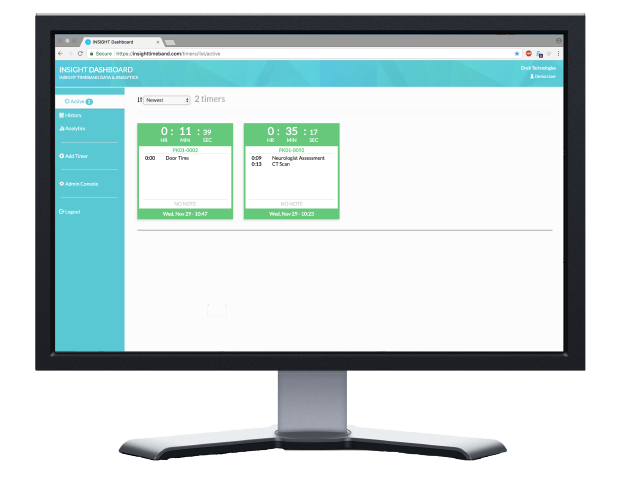 Use INSIGHT Dashboard to view all active timebands and collected timepoints. Understand your process, evaluate your goals, and have data ready for reporting needs! Learn more about the INSIGHT Dashboard.